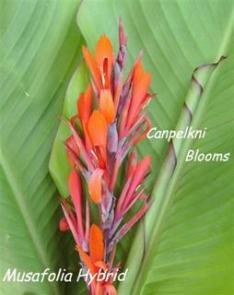 Limited selection of Canna for sale to Australian buyers, No International Postage available. Cannas are only posted to Victoria, New South Wales, South Australia and Queensland. 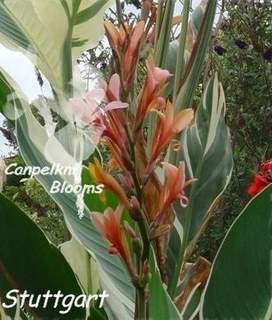 Healthy canna rhizomes/plants are supplied bare-rooted with some excess leaves and roots trimmed. No plants will be posted to Western Australia, Northern Territory or Tasmania. Postage flat rate of $15 via Australia Post. You may Checkout using your credit card or Paypal account. To pay by bank deposit, email your order through along with your name, address and phone number through the Contact Form, for additional quantities email for availability. Heights listed in descriptions are from my garden conditions, visit Heights of Canna Plants for how short and tall they can grow. 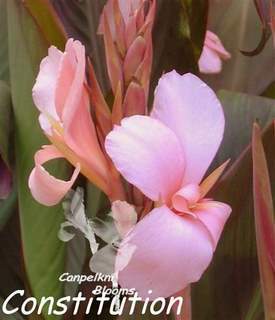 Constitution, with creamy pale pink blooms held above beautiful foliage of soft tan, pewter, purple n bronze, in cooler weather I have noticed her blooms change to a soft pinky apricot tone, I have had canna Constitution grow up to 1.8 meters tall, this canna was imported into Australia pre 2005, produces seed- yes. 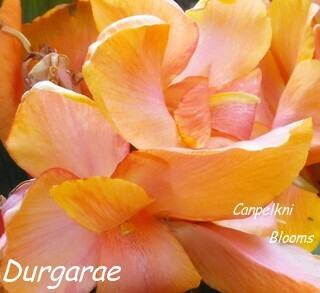 Durgarae from golden apricot blooms to soft apricot n pink with irregular placed pink bleeding that only seems to be consistent on and near the edges of the staminodes, labellum and stamen beautifully shaded too, canna Durgarae shows dark bronzed over green foliage, I had this beauty grow up to 1.4 meters tall, raised 2007, produces seed- yes. Canna Intrigue raised USA, very architectural with unusual narrow foliage beautifully colored with brown to bronzed purple, simple apricot to pink flowers, tall slender upright growth, around 2.5 meters tall, seeds yes, recent import to Australia pre 2005. Parent plant to Eraendarae. 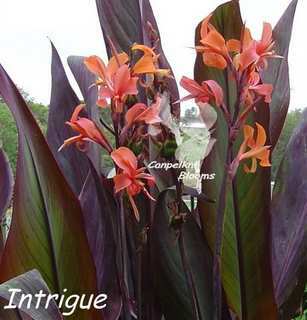 Read a full description about Canna Intrigue. Canna Musafolia hybrid, this is not to be confused with the true Musafolia which this vintage hybrid closely resembles, Musafolia Hybrid has green foliage with slender mid brown stems and midrib, new leaves display a dark burgundy margin. 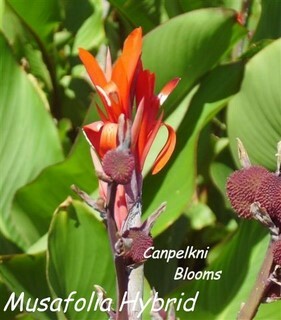 Musafolia Hybrid is very early and free flowering constantly with simple orangey red blooms and increases very well, reaching 1.6+ meters tall and is an extremely dry tolerant canna. 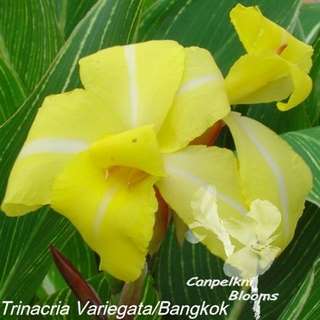 Canna Trinacria Variegata/Bangkok heritage cultivator 1920s, a white cross perfectly displayed over yellow blooms that open from red buds, variegated green leaves veined white, 1.4 meters tall.